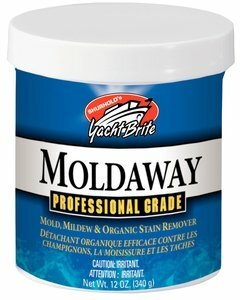 Shurhold Yacht Brite Moldaway 12oz #271-YBP0801 A powdered oxygenated cleaner that removes stains from mold, mildew, algae, dirt, blood, food and drinks. It contains no bleach or chlorine products. Safe on most colors and fabrics. If you have any questions about this product by Yacht Brite, contact us by completing and submitting the form below. If you are looking for a specif part number, please include it with your message.